David Wallace learned the basics of being a writer as a Communications major at Crown College in St. Bonifacius, MN – his parents’ alma mater. After completing his bachelor’s degree he returned to his small, coal-mining hometown of Homer City, PA. He worked to pay off his school loans and then wandered into the Department of English at the local university. Thinking that being a college professor might be kind of cool, he enrolled in a couple graduate courses. The instructor of his first graduate course about teaching writing wisely advised him to gain experience by working with students in the writing center and so it was in Indiana University of Pennsylvania’s Writing Center that he fell in love with the teaching of writing. Just a month after he completed his MA in Rhetoric and Linguistics he began a Ph.D. program in Rhetoric in the Department of English at Carnegie Mellon University in Pittsburgh. There, he had the good fortune to study with ground-breaking rhetoric and composition researchers Linda Flower and John R. Hayes. He also worked as a research fellow at the National Center for the Study of Writing and Literacy at Berkeley and Carnegie Mellon. 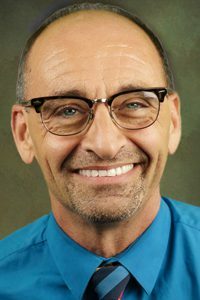 After he completed his doctorate in 1991, he packed himself off to Ames, Iowa, to become an assistant professor of rhetoric and composition at Iowa State University (ISU) where he helped launch a new Ph.D. in Rhetoric and Professional Communication. In the 11 years he spent at ISU, he taught graduate and undergraduate courses in rhetorical history and theory, research methods, and composition pedagogy. His research focused on the challenges of teaching writing in first-year composition classrooms and looked particularly at how those challenges intersected with issues of race, gender, class, and sexual orientation. To keep his life interesting in rural Iowa he learned to cook, raised dozens of varieties of hostas, played lots of volleyball, and served as the faculty advisor of the ISU Waterski Club. After 11 long winters in Central Iowa, he escaped to Orlando, Florida, and a job teaching writing and rhetoric in the Department of English at the University of Central Florida. There, he helped launch a Ph.D. program in Texts and Technology and taught a wide range of courses, including first-year composition, upper-division writing courses, rhetorical history and theory, feminist theory, and the Bible as literature. In 2008, he became chair of the Department of English just as the university received the first four years of budget cuts. Two years later, he became the founding chair of the Department of Writing and Rhetoric and helped create a comprehensive writing program for the university. Dr. Wallace’s experiences chairing large departments at UCF, the second largest university in the nation, during difficult budget times prepared him well for the challenges of being Dean of the College of Liberal Arts at CSULB in similarly challenging times. What are the core values of the College of Liberal Arts? The College of Liberal Arts provides a high-quality education to first-generation college students and others for whom a college education may otherwise be inaccessible. The CLA is committed to engaging students in scholarly disciplines and debates, introducing them to new research methods, exposing them to the history and lived experiences of a number of groups who have been historically marginalized in American society, and preparing them for both their professional and civic lives. How is your past administrative experience as chair of the Department of Writing and Rhetoric at the University of Central Florida (UCF) informing your current administrative position as dean? The primary difference between the two positions is scope. For instance, whereas I was dedicated to one department as chair of the Department of Writing and Rhetoric at UCF, I am now dedicated to 27 departments and programs as dean of the College of Liberal Arts. However, despite the scope, the two positions involve similar challenges, particularly managing curricula in times of budget shortfalls. Also, my experience with the mentoring project at UCF for untenured faculty informs my current administrative position as dean. I am committed to helping tenured faculty receive the support they need to succeed. Apart from your administrative experience, how are your experiences as an award-winning teacher and an accomplished scholar informing your perception and performance as dean? My previous job allowed me to engage with students on a regular basis, and my scholarship has always been in the humanities and social sciences. Serving as dean of the College of Liberal Arts feels natural to me. Challenging budget conditions continue to face the University and CLA. How will the college meet these challenges while maintaining its focus on student and faculty success? The challenges of the budget cannot be avoided. One such challenge necessitated that the college trim curricula with consideration of ongoing student success. Additionally, the current budget makes financial support for faculty research very difficult. However, although the economic downturn and decreasing state funding continue to present challenges for those involved in higher education, the lasting dedication and talent of our faculty, staff, and students convince me that we are up for any challenge. What would you say is the strength of the CLA? The strength of the CLA is its faculty. I have been continually impressed by the faculty and their willingness to go beyond the requirements of their positions to make sure students receive a high quality education. CLA faculty demonstrate excitement about their curricula and believe in what they teach. They face challenges head-on and continuously find ways to inspire interest and participation from their students. How have your first couple months at CSULB been? Invigorating. There’s an energy in the college that we – the faculty, staff, and students – find very attractive and engaging.